Welcome to my first article for Around Canton! Every other month or so, I will share thoughts on a couple of my passions – the City of Canton and cooking. As a Canton city councilman and mayor pro tem, I will try to give a brief update about areas of interest in our city, and as a home cook and self-declared foodie, I will share a recent recipe or technique I have discovered in my kitchen at One Britt. Later this month, the mayor, council and city manager will once again spend a few days at a retreat to review, prioritize and brainstorm some strategic objectives for 2017 and beyond. We had a productive retreat last year, and I am happy to say that we met or exceeded several of our goals. This year’s topics will include, among others, a water and sewer master plan, restoration and repurposing of the Jones building in downtown, zoning and a comprehensive plan for the city, upcoming SPLOST referendum and paving projects for the year. We will be posting the priorities and goals from the retreat, so stay tuned. Now, let’s get to the meaty goodness. I have been a Julia Child fanatic since I was a kid, and I loved watching her cooking shows. I have all of her cookbooks, and tried many of her recipes. 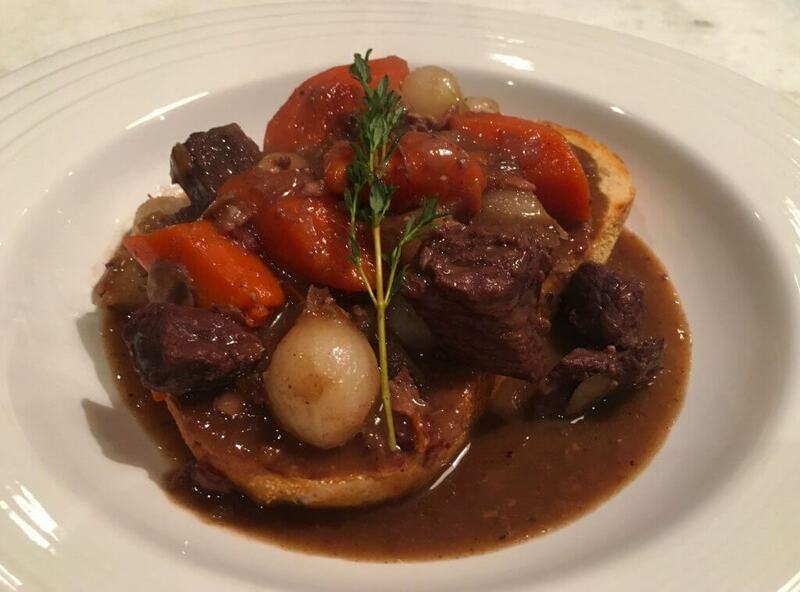 One of my favorites is her quintessential beef bourguignon. Without a doubt, there’s nothing better on a cold winter’s night, and the aromas in the kitchen are second to none. However, her version is quite the undertaking, requiring hours of preparation and multiple, separate steps. While the final product is a feast to behold, I searched far and wide to find a simpler method. After experimenting with several versions, I finally combined components of each to create an easier, yet delicious, version of beef bourguignon that can even be prepared ahead of time and warmed up for guests. I serve it over a hefty slice of grilled sourdough for a rustically elegant presentation, and it never disappoints. Here’s my recipe, but don’t be afraid to add your own touches. That’s what cooking is all about. Just remember, beef is the star of this dish, so the end result will depend on the highest possible quality of beef. I prefer local grass-fed beef. Heat the olive oil in a large Dutch oven. Add the bacon and cook over medium heat for 10 minutes, stirring occasionally, until lightly browned. Remove the bacon with a slotted spoon to a plate. Dry the beef well with paper towels and sprinkle with salt and pepper. In batches without crowding, sear the beef in the hot oil for 3-5 minutes, browning on all sides. Remove the browned cubes to the plate with the bacon and continue searing until all beef is browned. Set aside. Toss the carrots, onions, 1 tablespoon of salt, and 2 teaspoons of pepper in the remaining fat in the pan, and cook for 10-12 minutes, stirring occasionally until the onions are light brown. Add the garlic and cook for 1 minute, then add the Cognac (if using). Standing away from stove, ignite with a match to burn off excess alcohol. Add the beef and bacon back into the pot, then pour the bottle of wine and enough beef broth to just cover the meat. Add the tomato paste, thyme and bay leaf. Bring to a simmer, then cover the pot tightly with a lid and place it in the oven for about 1 ¼ – 1 ½ hours or until the meat and vegetables are tender when pierced with a fork. Remove stew from oven. Combine 2 tablespoons of butter and the flour with a fork, and stir into the stew. Add the pearl onions. Sauté the mushrooms in 2 tablespoons of butter for 10 minutes until lightly browned, and add to the stew. Bring the stew to a boil on stovetop, then lower heat and simmer for 15 minutes until thickened. Remove bay leaf and thyme sprigs and adjust seasonings to taste. Serve over grilled, thick slices of sourdough or country bread rubbed with garlic. Sprinkle with chopped parsley.